Investigator Michael David Davis, Sr. Investigator Michael Davis was killed in a helicopter accident while working on a multi-agency narcotics task force along the United States border. A suspicious vehicle was spotted in a canyon on a remote access road in the Mountain Springs Grade area. The UH-1H helicopter began to descend when its rotor blades struck power lines and caused it to crash in the foothills of the Laguna Mountains. Also killed in the accident were Investigator Michael Davis of the Riverside County Sheriff's Department, Deputy Roy Chester of the Los Angeles County Sheriff's Department, Sergeant Richard Romero of the Imperial County Sheriff's Department, Deputy Mark Tonkin of the Orange County Sheriff's Department, and the three California National Guard crew members operating the flight. 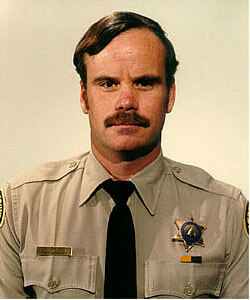 Investigator Davis had served with the Riverside County Sheriff's Department for nine years. He was survived by his wife, four sons, daughter, parents, and siblings. One of Investigator Davis' son, Investigator Michael Davis Jr., was shot and killed in the line of duty on October 24th, 2014, while serving with the Placer County Sheriff's Department. Their line of duty deaths occurred exactly 26 years apart to the day. Detective Michael David Davis, Jr. I often stop by your portrait at SIB and think about the type of Investigator you were (narc, highly-decorated, pistol champ) and how to better myself, in honor of your sacrifice. You have set the bar for all of us in that building. Not by how you died, but by how you lived. Rest easy, brother.